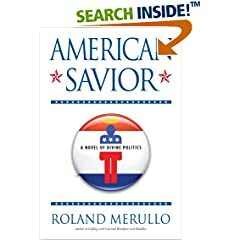 I picked up American Savior by Roland Merullo on a whim. Call it a divine appointment if you will. Just a few days before Amazon served it up to me as something I might like, I was bemoaning our current political atmosphere and made the comment "Jesus Himself couldn't get elected in America". Lo and behold, then Roland Merullo's novel comes along. I had to read it. Of course it's an unlikely story. Those critical of the book saying Jesus would never run for office remind me of people who don't get a the joke "A duck walks into a bar and says..." because, they say, ducks can't talk. The point of the book is not that Jesus would run for office. The point is what if Jesus did run for office. The story is narrated by a mediocre reporter that Jesus chooses to head up his campaign security. The disciples Jesus chooses to help him are like the disciples he chose in the Bible. You scratch your head saying "Why would he choose...?" They're confused people lacking confidence like all the rest of us. I think Roland Merullo did an excellent job of capturing the essence of Jesus. Jesus was a man who intrigued the intellectuals. The Pharisees and Saducees might have hated Him but obviously He was no intellectual lightweight. Jesus can charm the women. He's a man's man. He's loved by children. He's macho and sensitive at the same time. He's humorous. He's sharp tongued. He infinitely patient yet at times He becomes exasperated. Just as some see the Jesus of the Bible as warrior and some a pacifist, such is Roland Merullo's Jesus. Some might complain that Roland's Jesus is too left leaning or his Jesus is too right leaning. That's the point! The Jesus of the Bible was also criticized when His views didn't meet expectations. When He didn't come down on the side that was "obviously" right (like whether they should pay taxes to Caeasar). Roland Merullo's Jesus refuses to be politically correct. Honestly, some of the characters in the book outside of Russell (who narrates the story) and Jesus are pretty flat. But, who wouldn't be standing next to Jesus? The story pulls you forward wondering what Jesus will reveal next. Roland puts some very deep theological/philosophical/existential thoughts in the mouth of Jesus. Some will find them too "New Age" I'm sure. But, this book is not really for your more fundamentalist Christians. It's for people who are still exploring who Jesus was, what He meant. What was His real mission? If He came back today, what would He do? Some might be shocked when Jesus says He didn't come (the first time or this time) to be worshipped. He came to be emulated. Those who think it's all about what you think of Jesus will be appalled to hear Jesus say He doesn't care what you think about Him only that you develop what is already inside of you. When Jesus refuses to take a stand making abortions illegal (and sounds more like Barack Obama than Sarah Palin) some will find that utterly unthinkable (as did several of the characters in the book). But, Roland presents us with a Jesus who is almost as mysterious and intriguing as the Jesus of the Bible.